With the holidays approaching quickly, families across the country are getting ready for many holiday parties, visitors in their home and LOTS of snacking! Whether you are trying to provides snacks for adults or children, I have the perfect holiday snack ideas to keep your guests healthy AND happy! 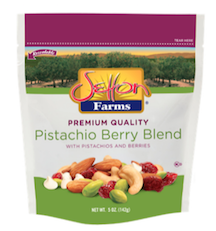 These new nut blends from Setton Farms are perfect for guests with all types of taste buds and cravings!! 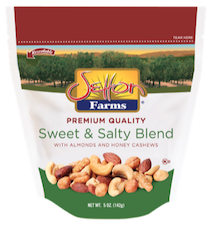 For your holiday guests that like it sweet and salty, the Sweet & Salty Blend is for them- made with almonds, cashews, peanuts, sea salt, and pure honey, this is the blend for them. For your holiday gueststhat likes it a little tart and sweet, the Pistachio Berry Blend is their top pick- made with premium California pistachios, almonds cashews, cranberries, and cherries, and white chocolate chips, this is the perfect blend for them. 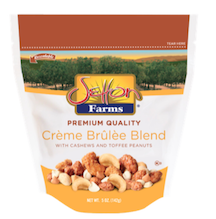 For your holiday guests with the sweet tooth, the Crème Brûlée Blend is the ideal snack- made with roasted cashews, toffee peanuts, and butterscotch chips, this blend will satisfy their sweet cravings. All blends are available in major grocery store chains across the country such as Price Chopper, Market Basket, King Kullen, Schnucks, Hy-Vee and other independent retailers. They are also available online at puritan.com. And for the snackers that need a little fruit boost or for the children at your holiday parties, serve Fruit Me Up! fruit sauce pouches to put lots of smiles of faces! Fruit Me Up! is a new brand behind an innovative line of naturally better-for-you fruit sauce pouches! Designed for active kids and families, Fruit Me Up! pouches are made with real fruit, recognizable ingredients parents trust and no artificial ingredients or additives. The pouches are available in three varieties - Fruit Me Up! Organic, Fruit Me Up! Naturally Better and its unique line of nutrient-rich Fruit Me Up! BOOST pouches - so there's a flavor and pouch that's sure to please even the pickiest palate. The pouches contain less sugar and calories than competitor products, and they are all shelf-stable so they can safely live in the car, in a backpack or locker, or be stored in the pantry for a convenient snack that's always at the ready. Our family's favorites are the organic varieties! They offer four flavors of classic applesauce varieties but all are made from organic fruits with no added water and no high fructose corn syrup for a real fruit taste and goodness! Fruit Me Up! fruit pouches can be purchased online and at local retailers.